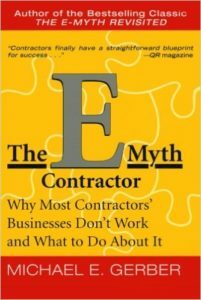 In his book The E-Myth Contractor author Michael Gerber describes a problem inherent to most all small business owners. They often find themselves all wrapped up and even buried in doing the technical work that the company sells to it clients.They are swinging the hammer, laying the tile, painting the walls and not spending as much time as they should doing what most important for the business’s survival. Selling, marketing, estimating, managing the projects, and perhaps most important of all managing the business itself. The real aware business person knows you need to…Work on Your Business, Not in Your Business. Creating business system processes allows any organization to create a predictable way to produce success. We Help Small Businesses Build Those Systems. But what exactly does that mean? What does that entail? The key to efficient and profitable business operations for building, remodeling, and trade contractors as well as architects and designers and home and garden small businesses in lean times is the development of turn-key systems or methodologies to run your core business operations by so that every time a member or you organization performs a task they aren’t reinventing the wheel procedure wise. Our goal is to work with dedicated and serious building & remodeling professionals on the development of these tools and systems. In our initial meeting we learn more about you and your specific goals and desires. We explain our programs and together we determine which ones might be appropriate for you. If we decide to work together, we will provide you with a proposal outlining our fees and services and you’ll provide us with a small retainer to begin working on your project. ParadigmProjects will work with you to determine and design a strategy and process for implementing a business process improvement program in any one of, or any combination of, in the areas you need. We evaluate your needs. We believe we must first understand you, before we can even begin to help you. We ensure our talents and capabilities match what you need. We help develop an optimum implementation plan, considering your long term goals and current capabilities. We believes that your complex challenges require comprehensive, but simple, solutions.Our goal is to find the elegant, simple solution to your challenging issues; without compromises or trade-offs. There is a bias towards planned, precise action for practical improvements; moving with high velocity from start to finish. We will use The Agile Project Management model to get you up and running quickly. Where appropriate and whenever possible, we will transfer our skills and knowledge to you and your employees so they can continue the improvement process. We coach, encourage, guide, assist, and challenge you and your people to the next step in your journey to excellence. The Paradigm Projects Mission Is To Create Business Systems And Solutions That Help Contractors Minimize Risk, And Lower Costs While Enabling Them To Deliver Projects Of Increased Value Through Improved Interactions With Customers, Their Contracting Partners, And Suppliers.